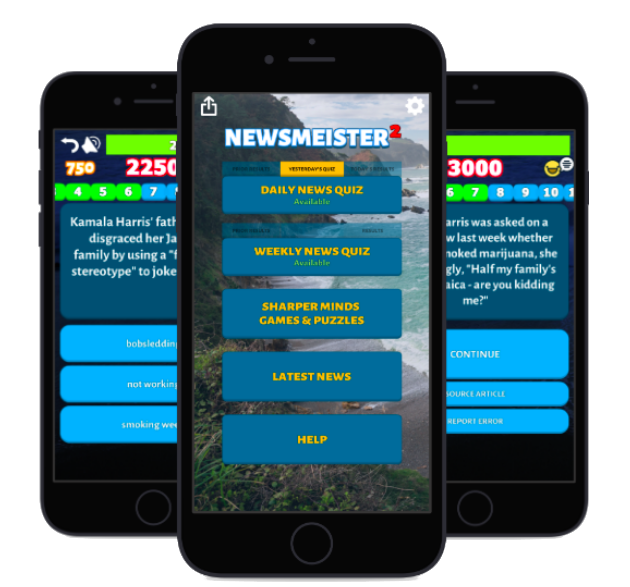 Newsmeister’s Daily News Quiz is a free, short, daily news quiz that takes less than 3 minutes to play, and offers news junkies worldwide a chance to outscore their friends. Questions focus on trending global news covering sports, business, politics, technology, entertainment, science, and literature. All questions are fact-based, not pulled from op-ed sections. Once an answer is revealed, a link to the source is provided so that users can read the full article. Attention Teachers! It's the perfect student news quiz. Click here to get our Student News Ad Free version. "It’s a great, new way to brush up on the day’s headlines and keep yourself informed." "The news has become a game in Newsmeister for iPhone." "Newsmeister is a solid resource to get people paying attention to the news. Teachers will certainly want to consider this app for any classes related to current affairs." "Every now and then an app comes along that surprises me, and proves to be far more enjoyable than I was expecting, and Newsmeister is just that: surprisingly enjoyable." "This app combines fun graphics, entertaining background music, and of course excellent trivia gameplay all in one package." We are looking for strategic partners!